"The EH504 is superb. The colour reproduction and brightness is unlike anything I've ever seen. Expecting an 88% transparent surface to work well with any projector is a tough task, but the Optoma does the job perfectly. Colours aren't washed out like other projectors. I don't know of many products which would be able to give as good a result as this when there's not much to 'catch' the image and prevent bleed-through." Challenge: Charterhouse Holdings wanted a visual showstopper in its state of the art corporate headquarters and distribution centre. Solution: The company installed an Optoma EH504 projector and rear projection vinyl to display footage on its glass partition walls that would maintain the light airy feel of its new suite. Charterhouse Holdings wanted a visual showstopper in its state of the art corporate headquarters and distribution centre. 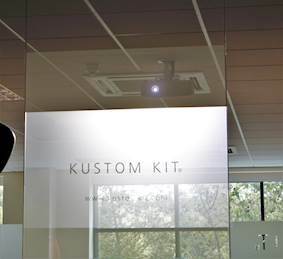 So that it maintained the light airy feel of the new suite, the business wanted to use its glass partition walls to project footage of its key brands on. This would need a bright projector to counter the ambient light in the room. The company installed transparent rear projection vinyl onto the glass with a transparency of 88% and an Optoma EH504 projector. Delivering Full HD image quality, the EH504 boasts a brightness of 5,000 lumens and features multiple digital connection options, with two HDMI inputs on rear and one hidden HDMI for the optional HDCast Pro dongle. 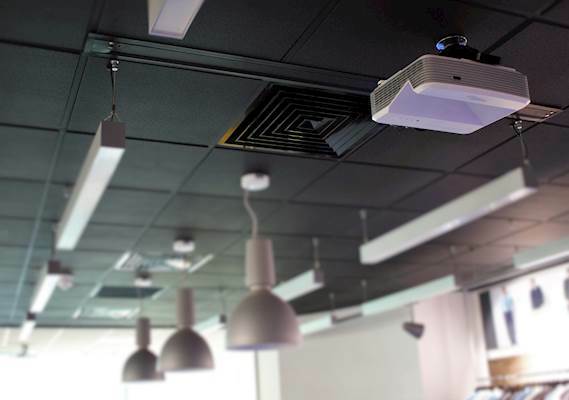 For more complex installations, this projector is equipped with a large zoom range, vertical lens shift and a built-in geometric adjustment feature - ideal for uneven walls or where a projector placement is awkward and needs to be installed at an angle. Daniel commented: "The EH504 is superb. The colour reproduction and brightness is unlike anything I've ever seen. "Expecting an 88% transparent surface to work well with any projector is a tough task, but the Optoma does the job perfectly. Colours aren't washed out like other projectors. I don't know of many products which would be able to give as good a result as this when there's not much to 'catch' the image and prevent bleed-through." Daniel added: "I can't honestly see us using any other brand from now on."